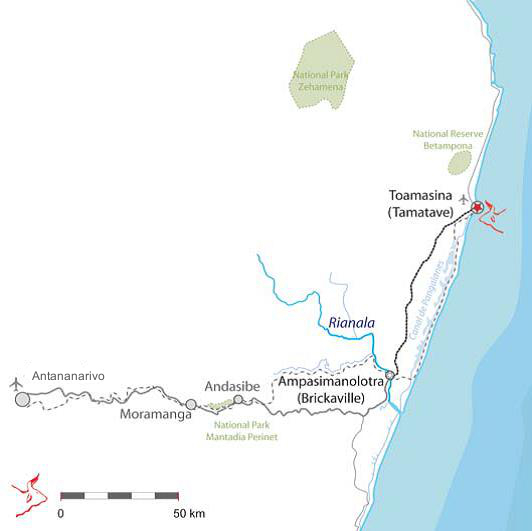 Driving on the RN2 from the capital Tana to Toamasina (about 370 km), you will see the scenery change. First, the red earth and the typical brick houses will attract your attention, then you will pass through the mountains with breath-taking views, before arriving in the rainforests around Moramanga. This first town after leaving Tana has several banks, some of which accept Visa and MasterCard, also at the ATMs. Here you can take a taxi-brousse to Andasibe, to Lac Alaotra, and Ambatondrazaka. 25 kilometres from Moramanga, still on the RN2, you have to turn left if you want to visit the Andasibe – Mantadia National Park, the Mitsinjo Reserve and the V.O.I. M.M.A.park. The next town along the RN2 is Brickaville. You have arrived in Madagascar’s fruit region. In Brickaville the people from surrounding villages sell their fruits, which will then be transported to the capital. Large plantations of lychees, bananas or mangos can be found here, as well as sugar cane and spices like cloves, cinnamon and the world’s best vanilla. Brickaville has a hotel and several hotelys (small restaurants). Travellers who opt for a trek in Fetraomby and surroundings will start their boat trip from here..
After passing Brickaville, you are at two thirds on the road to Toamasina already. 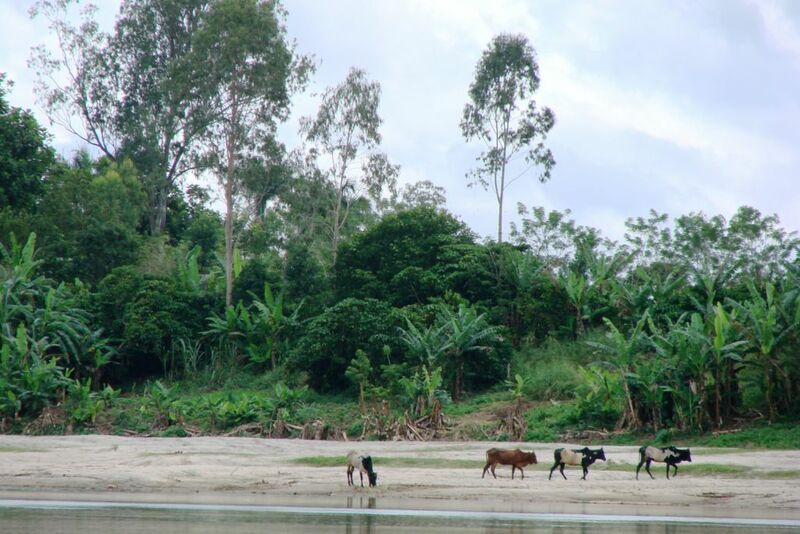 After crossing the Rianila River, the scenery will change again, you will be travelling north parallel to the coastline. The Ravinala (Travellers’ Palm – national symbol of Madagascar) grows in abundance here. You will sense the nearby presence of the Indian Ocean. Every now and then you may catch a glimpse of the Canal des Pangalanes, mentioned above. Once you have passed the impressive oil palm plantation of the Palmeraie, Toamasina town is only another 20 km away.